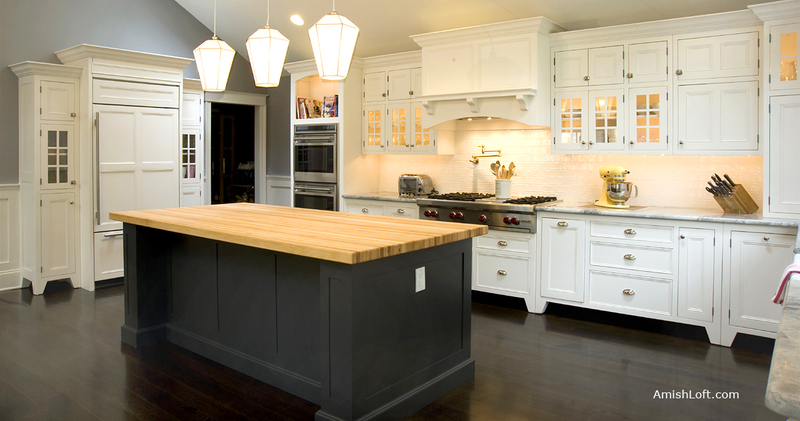 Our free standing kitchen cabinets are crafted in the same fashion as quality furniture. If you move, you can actually take the kitchen with you, as you would your furniture. free standing kitchen furniture, and free standing bathroom vanities. Our free standing cabinets is competitively priced with quality custom cabinets, but offers much more. Using traditional techniques, local Amish and Mennonite cabinetmakers who live in Lancaster, PA, build our superior quality cabinets. Doors, drawers, all types of shelving, drawer boxes, cabinet frames, and feet are crafted using solid wood. Our drawers are self-closing and extend fully. Mortise & tenon joinery is used throughout. Painted and stained cabinets have a rich, soft satin finish, without any hint of a plastic-like appearance. We also custom design and make built-in kitchen cabinets. We offer Amish Quilts handmade in Lancaster County, PA. Beautiful designs and meticulous hand-quilting are the qualities we look for and bring to you. We have traditional pieced and appliqué patterns and newer designs too. The fabric is always 100% cotton. You'll find bed quilts, baby and crib quilts, wall hangings and throw quilts.